Using a Bow Maker can help you get that perfect result every time. Add them to shoes for decoration or sew them onto skirts and dresses foir a really pretty look. You can even make them to tie on to your Christmas Tree of decorate your Garlands for the festive season. Just the simple addition of a bow to your cards can really make all the difference to the finished look. If there is something missing from your creation then take a step back and think about what extra will it need to take to transform it from the plain to the outstanding. And more often than not a bow can be the finishing touch ... that and a bit of "Bling" or some pretty flowers ... but a beautiful bow can even enhance those too. This bow is a Double white satin bow with Tails and a large embellishment in the centre to hide the knot. 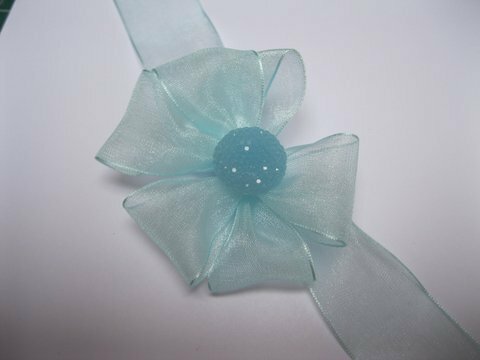 This is a Triple Bow from Turquoise Organza ribbon. This type of soft and pliable ribbon ties so easily and makes the most gorgeous bows for you to use. Try tying them in singles, doubles, triples and even try four loops to make a really effective bow for your projects. 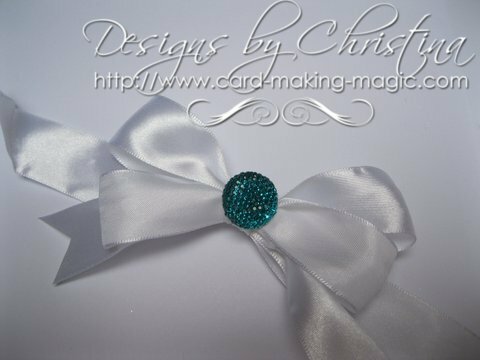 This beautiful card has the finished triple bow added to the front and in the centre of the bow I have used a Dazzler to hide the knot. You can use button, flowers, chipboard, Card Candi or anything else that you may have in your "Stash". Another good ribbon to choose is wire edged ribbon and the effects from that are simply wonderful. Make them in colours that will match your Christmas theme and add them tied to the branches of your tree.